We have had several supporting objections lodged with An Bord Pleanala, including one from our Wicklow County Councillor, Derek Mitchell. Derek has been keeping an eye on water issues in Wicklow for a long time and has a keen interest in seeing that we are treated well. He also has an interest in the history of the Vartry and the Blessington Lakes and those that suffered when they were first built. 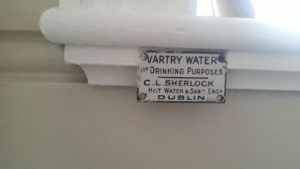 He found this Photo taken in 2016 in building in Gardiner Street, Dublin, 1. ,Enamel sign from the 1800,s promoting Vartry water! This was a revolution in its time, “Power. Particular about his drink. 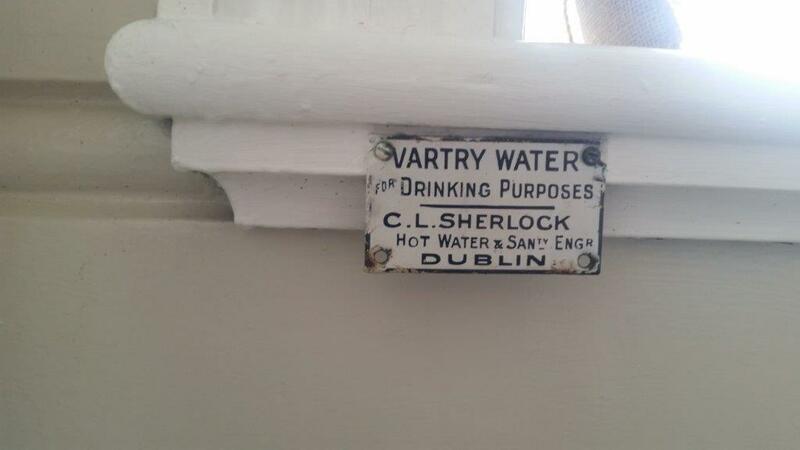 Flaw in the glass, fresh Vartry water.”, as Joyce put it.